In the last year or so, I keep hearing Bob Ross this, Bob Ross that. You should watch Bob Ross, memes memes memes. And I’m like, “What’s going on? What’s so great about Bob Ross?” So I watched a video on YouTube, can’t remember which one because I watched a handful more afterwards. My first impression was, he’s amazing. Everything about him is amazing. His voice, his humour, and let’s not forget his ability to make blobs from his brush into stunning pictures in less than half an hour! My second impression is that his videos are very soothing. So, calmed and inspired, I decided to paint a picture by following along with a video. First, I noticed he uses oil paints in the videos. I was out of turpentine to clean my brushes, so I had to use acrylic paint. Second, I only have CMYK + white for colours (I’m cheap). Third, my brushes are nothing like his in shape or bristles. Not about to let little things stop me from my quest, I forage on. This 25-minute paint along ended up being 3 hours, and never have I ever been so coated with paint. Yet he’s spotless. I digress, let’s start at the beginning. Knowing what my challenges were, I selected the brushes that I thought would produce similar effects. I coated my canvas in Titanium White mixed with a gel extender. I then made up the required Indian Yellow with Yellow and Magenta, then I made some Yellow Ochre using my Indian Yellow mix with more Magenta and a smidge of Cyan and Black. Things weren’t going as nicely as his already, the blending was terrible. But I kept going. 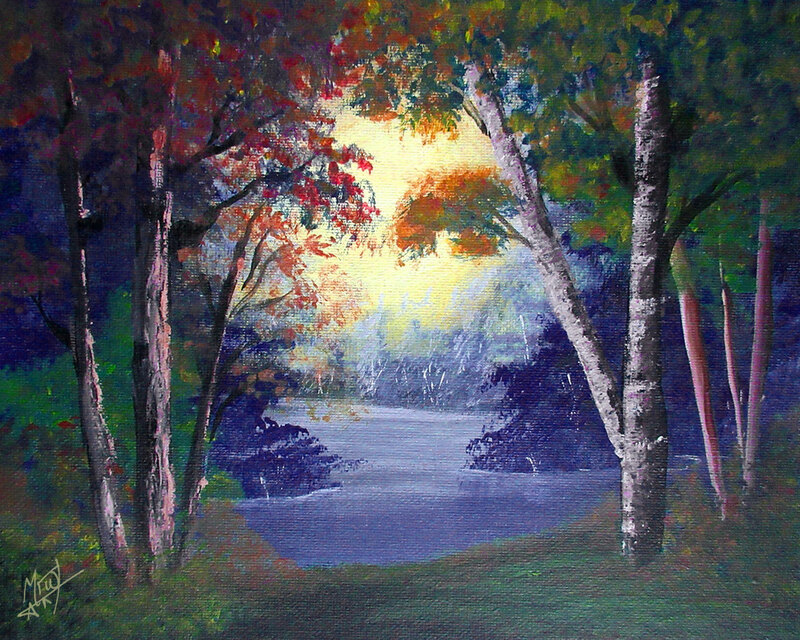 Bob Ross then mixes Phthalo Blue and Alizarine Crimson together to make a purplish colour. I pause this video to make the Phthalo Blue, then the Crimson, then I mix the two together and paint on. Then I run out of paint because acrylic doesn’t go as far as oil, and I have to make up a new batch. Then I have to do it again, and again because it turns out he keeps coming back to this mixture. My mixes became very sloppy, inconsistent, and more blue than purple. As I worked, I found that I was listening to his instructions rather than watching and I had to keep pausing the video to catch up with him. Halfway through, when pausing the video, I stepped back and got really excited because in my painting, for the first time ever, I saw depth! Perspective (my nemesis), this time I win! Together, Bob Ross and I were creating something I never seemed to be able to do on my own. He showed me how to make tree trunks and bushes, water and light. He taught me to work from the background to the foreground. My picture is darker and muddier than his, but damn it, I’m proud of what I did! So I took a picture and wrote this blog to share with you. I even framed this one to put on my wall! One last thing. I feel as if I’ve seen this painting before. Not his, but one like mine hanging in my grandparents’ house… Is it possible that my mother or one of her siblings had a Bob Ross moment in their life too? Only poor souls! They wouldn’t have had the luxury of a pause button! Have you discovered Bob Ross? Have you painted along with him? Did you like the results? Painting with Bob Ross. Season 28 episode 10, Splendor of Autumn. Acrylic on canvas.